I hope you are all enjoying the last week here in August. I realized that I missed a couple of things in my last post. Firstly, I missed my blog anniversary! I have officially been blogging for a year now! I have to say it’s hard to believe. A big thanks to those of you who have been with me since I started! I was also awarded The Beautiful Blogger Award by Karen at The Sweaty Knitter. She posts some of the most fascinating historical tidbits about fiber crafts and shares about her charming Norwegian heritage. You never know what you’ll learn when you stop in for a visit! Thank you Karen for your nomination! In the course of the past year, many things have happened in my life. 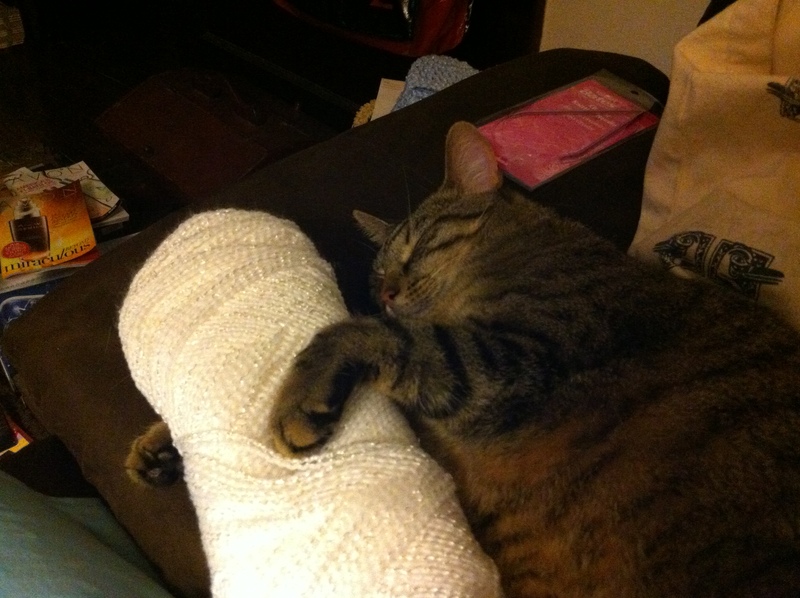 My beloved cat Mina has developed a taste for fabric. 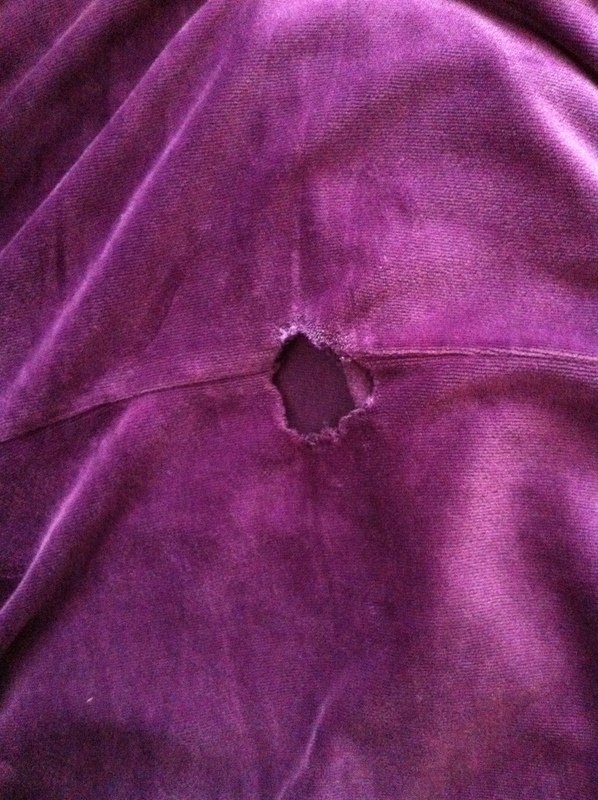 A pair of my pajama pants is the latest victim. We are now up to 3 tank tops, 2 bras, 2 shirts, a dress, and the pants. 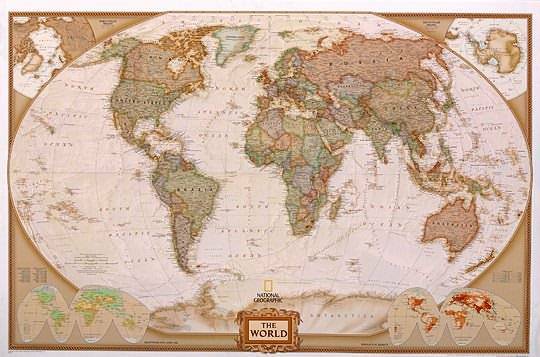 I have made friends living far from me ranging from the edges of my own country (ie: Florida & California) to other countries all together (ie: England & New Zealand)! It is wonderful to get to know people who live in other parts in the world, hearing about their lives and local cultures. If only we could meet in person for a cuppa to knit and share stories! I started doing yoga. I’ll admit I don’t do it as often as I should, but I thoroughly enjoy every session! My joints don’t enjoy impact exercises like jogging, but my muscles sure do love a good stretch. A yoga session seems to work well for my over-active brain as well. Any one else out there a yoga lover? And I learned to knit! My fiber world has grown exponentially now that I know how to knit. You all remember my very first knit project in my second post? A sad, wonky washcloth. I’ve since knit several things and here’s the updated picture of my very first sock! 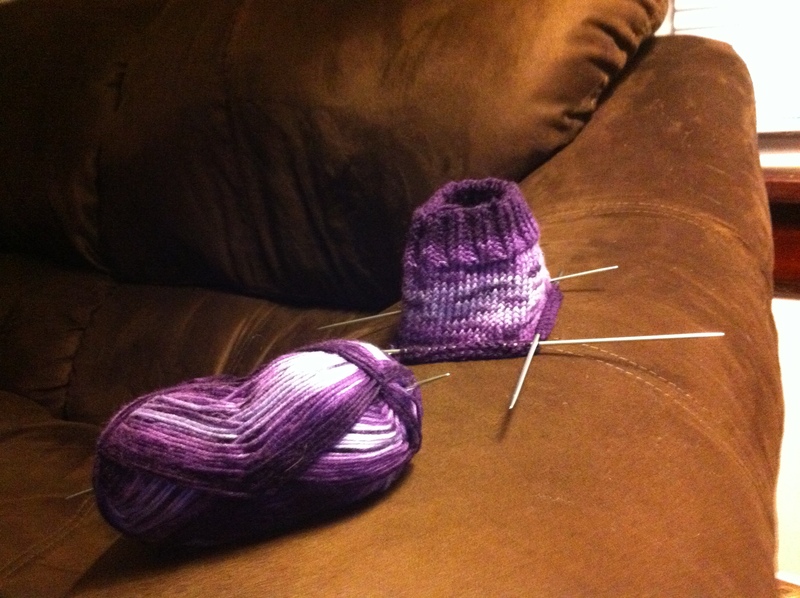 I got my first knitting cramp this past weekend turning the heel on that crazy thing. I will say once and for all, wool is certainly my favorite thing to knit with. This sock yarn is a microfiber material and there is very little give to it, hence the tension. I’ll admit that I spent so many hours working on this over the weekend that I simply had to say, “No more knitting.” I took a break from my sock, decided to leave my arm warmer in the bag, and start a crochet project! 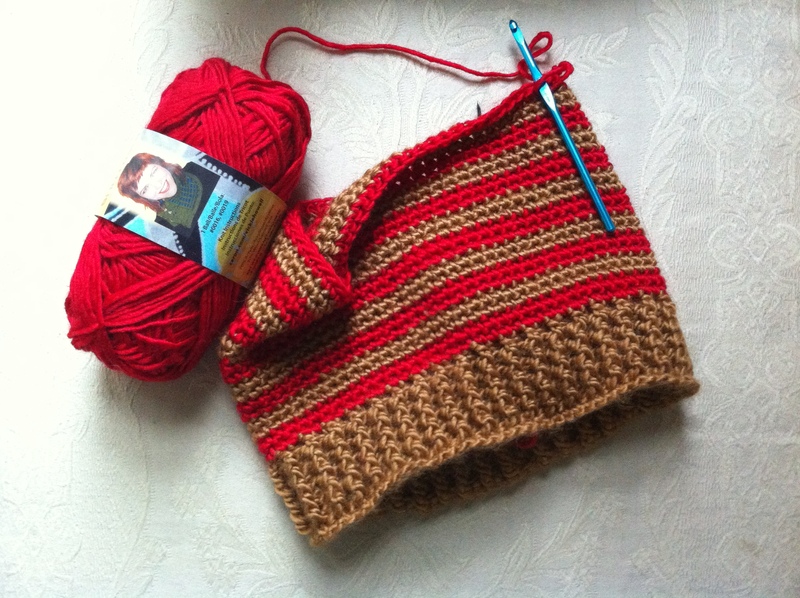 I told Cassie I would make her a hat like the one I made Sara Lynn last winter and she could choose the colors. This was the perfect time to begin her hat. Ahh. Soft, squishy worsted weight yarn, my default crochet hook, and swift, simple crochet movements. I do love crochet 🙂 The fact that I love this yarn brand and I love this pattern also help! I truly believe in the healing powers of switching projects periodically. My sock may sit for a while longer, but as soon as this hat is done I’m sure my arm warmer won’t be too far behind! The yarn for that project is much nicer to work with while knitting. The more I knit, the more I understand yarn snobbery. Synthetics tend to cause tension and cramps! Crochet doesn’t seem to be as bad. Any one else have those kinds of revelations or am I just overly sensitive to silly things? I wish you all a wonderful week and I will see you in September! I’m stopping by to do a post this evening because I have to share a little happy news with you! That and I might have to work on Monday (I normally don’t) and I don’t know if I’ll have time then to do my standard weekly post. 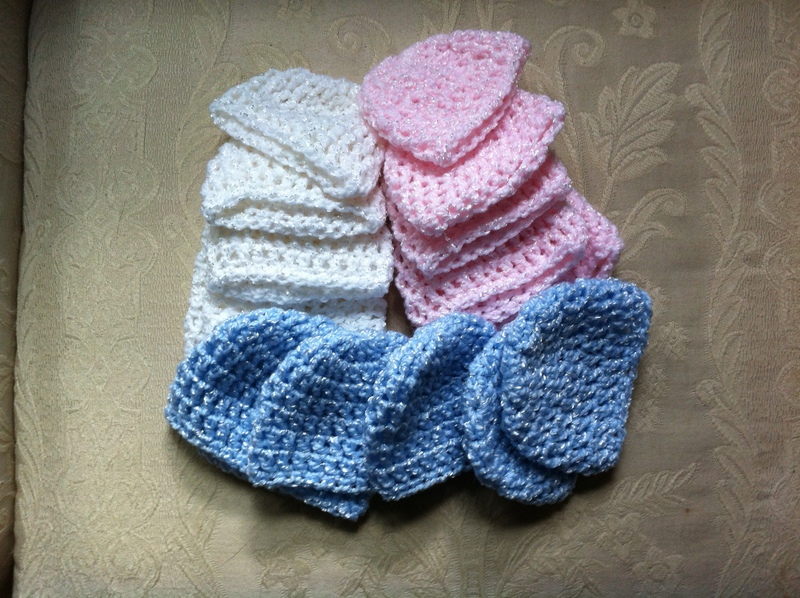 I have been busy, working away on those little hats for Lucy and her Project Rainbows. Mina had to help too of course. Silly Mew. I now have 5 hats in each color and I’m wondering if I should make a few more before shipping them out. Suggestions? Is 15 good or how many is appropriate for a donation? My happy little surprise came to me yesterday, or rather I stumbled into it. I park around the back of my house by a chain-link fence that separates my yard from my neighbor’s. 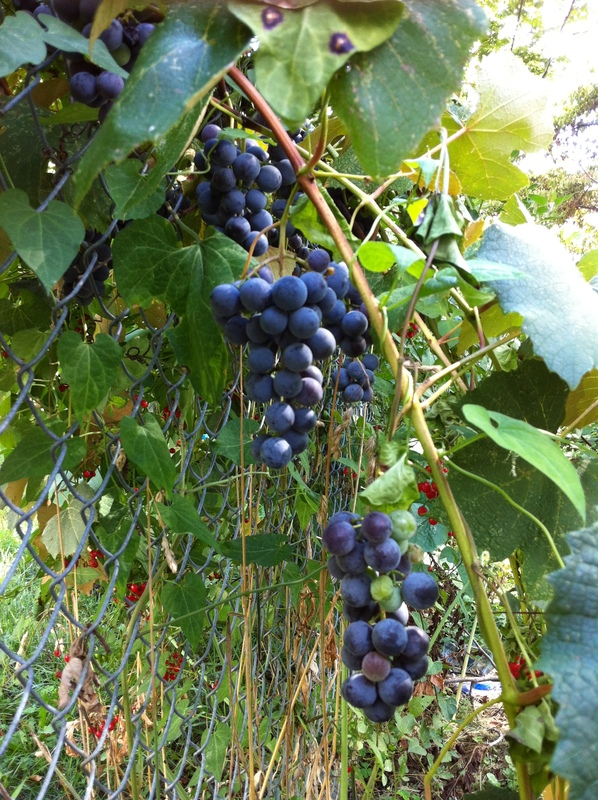 I rarely pay much attention to all of the growth that weaves in and out of the fence. There are countless plants that grow wild around it, including my lovely hollyhock and lilac bushes. I noticed some pretty red berries growing along one side and went to investigate. As I got closer, I thought I saw something growing against the fence. “Surely not, ” I thought, but I pulled back the vines and what did I see? 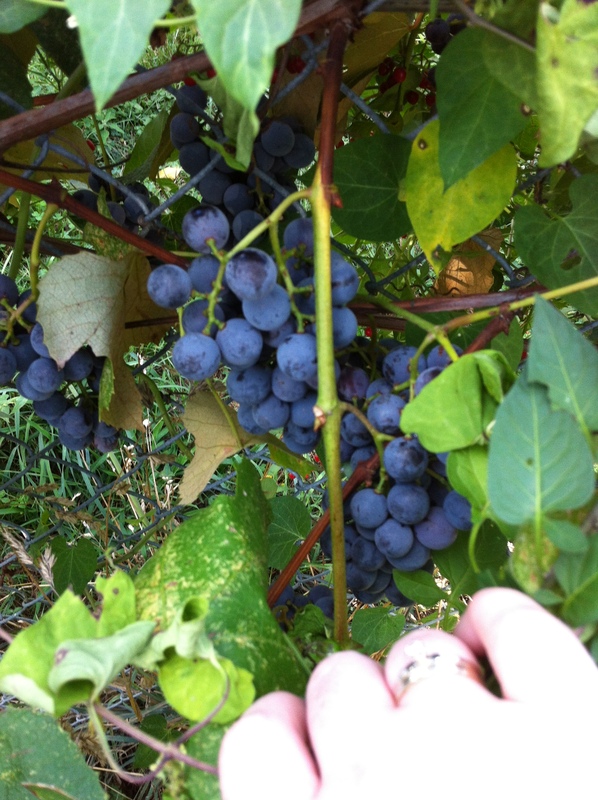 GRAPES!!! Growing in my backyard of their own accord! I simply could not believe the odds or my luck. See the little red berries that originally caught my eye? Lots of pretty little clusters growing all over! I checked with my neighbors since we share the fence. It seems as though they planted them there about 30 years ago and got tired of them about 15 years ago. They thought they had eliminated all of the plants. It seems that over the years some of the root remnants have come back and grown up amidst the other plants unnoticed. I recently heard that this summer was ideal for grapes in this region due to the crazy heat and dryness, so that must’ve been what caused the fruit to finally pop out! Our neighbors said I could do whatever I wanted with whatever grew and I am so very excited! I have never done any kind of canning or preserving in my life but I have wanted to for years. This is my chance to learn 🙂 When those purple beauties are ripe in a few weeks, I am making some grape jelly! I had rather a bum week this past week and this surprise was just what I needed to help cheer me up. I hope your weekends have a happy surprise for each of you! God Bless! Sorry I missed you all last week, but as my title suggests I have been busy wrapping up summertime. The school year begins this week for some and next week for most others. The time for summer fun is coming to a close and my non-work days have been busy with things such as Family Fun Day with our church, nights as the drive-in theater while it’s still open, and bonfires with our youth group since they won’t have as much free time with school in session. Our Family Fun Day is like a small carnival we put on for the community every summer, everything is free. 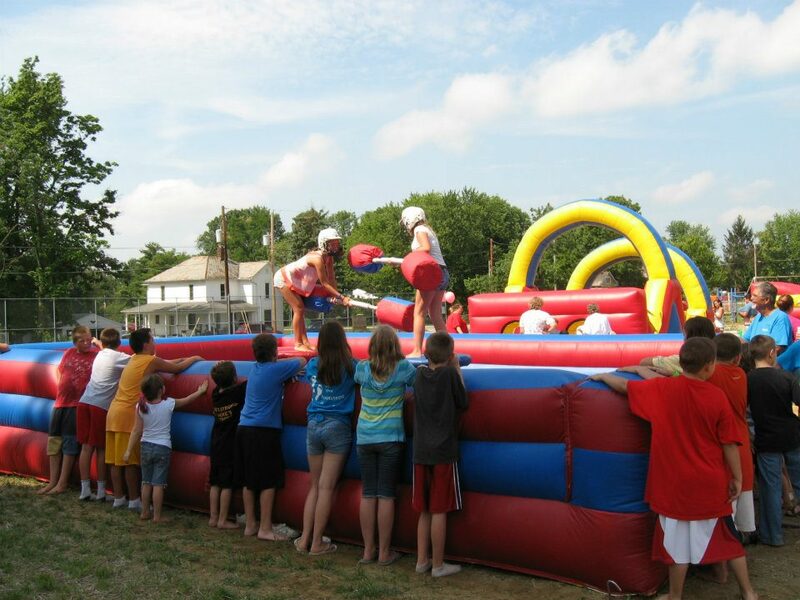 We rent big inflatables for the kids: a giant slide, an obstacle course, a gladiator arena, and something called a bungee run. Here is the gladiator arena. New and very popular this year! The two players stand on pedestals and try to know each other off. 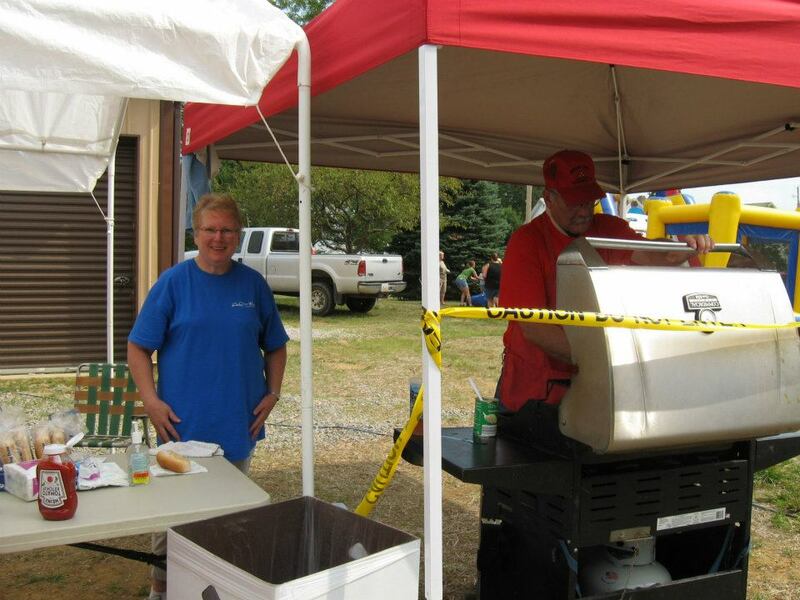 Food is also available to everyone: hot dogs, popcorn, cotton candy, and snow cones. I worked the popcorn stand for a while and seeing as it was already a 90 degree day, it got quite warm when the popcorn cooked! Luckily I was next to the snow cone machine so that helped to balance things out a bit when I didn’t have to man the popcorn. Donna and Keith always man the grill for the hot dogs. Kudos to them for bearing the intense heat of day along with the heat radiating off of the grill. This is the delightful couple who housed Bryon and I when I power was out for that week in July due to storms. 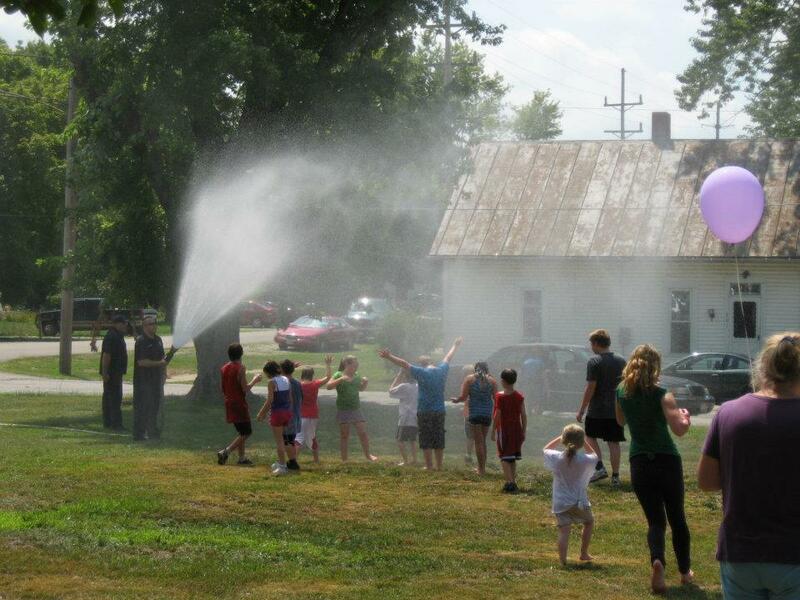 Due to the heat, we always ask the local firestation to stop by for a short span of time to hose down anyone wanting the relief of water. It’s always a big hit for the kids to have the big firetruck come in. The last of the kids cooling off. Many others had already run off to give wet, squishy hugs to their parents. It’s always a great time 🙂 Another summer favorite is going to the drive-in. When Bryon and I dated, we went nearly every weekend. We didn’t get to go at all last summer and it was very depressing. This year we were determined to go and we couldn’t have picked a better night to go. The weather was absolutely perfect and we got there early enough that we had a fairly good parking spot. 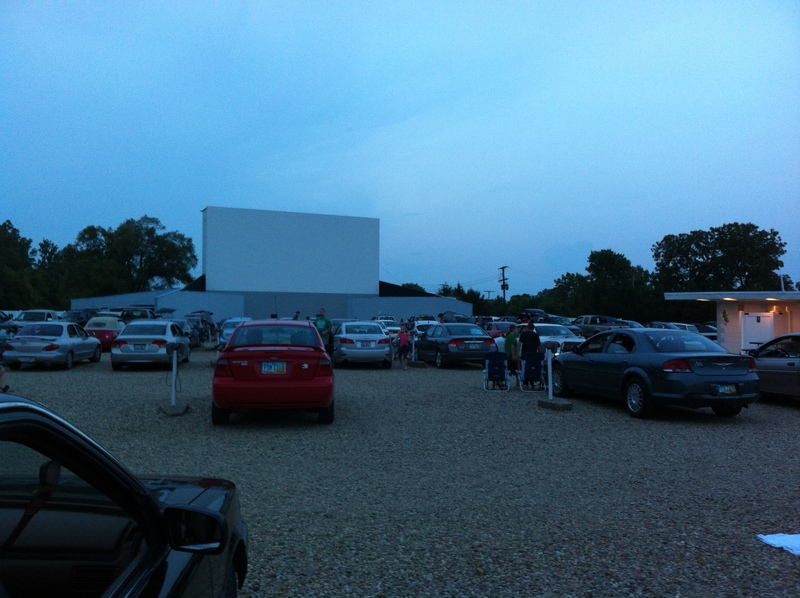 There aren’t many drive-ins left in Ohio so we are very fortunate to have one in our hometown! Two movies show back to back and it’s only $7 for an adult ticket. Waiting for the sky to darken enough for the movie to start. We went to the drive-in also as sort celebration for us. Sunday August 5 was an exact 5 year anniversary for the Sunday morning I first met the man I would marry. Who knew? The bonfire we went to was at the same house as always, so I got to see Eric’s laying chickens again. Remember that little spotty hen I told you all about? Well, it has grown into a massive rooster! Surprise! I forgot to get a picture for you, but I will get one. He’s really quite impressive. I had some quiet time by the fire where I was able to work on my WIPs, which have been coming along nicely! I’ve got a steadily growing pile of preemie hats for Lucy, I met all the goals I mentioned in my last post so my first glove is done and the second one is comng along nicely, and I have started my sock. I have been reminded that if I sit down and truly dedicate that time to knitting something in particular, things work up rather quickly. 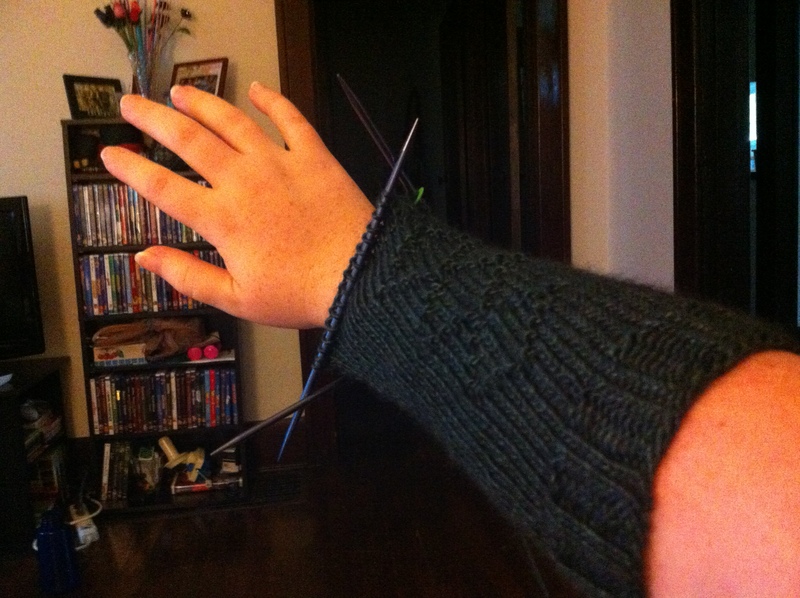 My second glove is already more than halfway done. 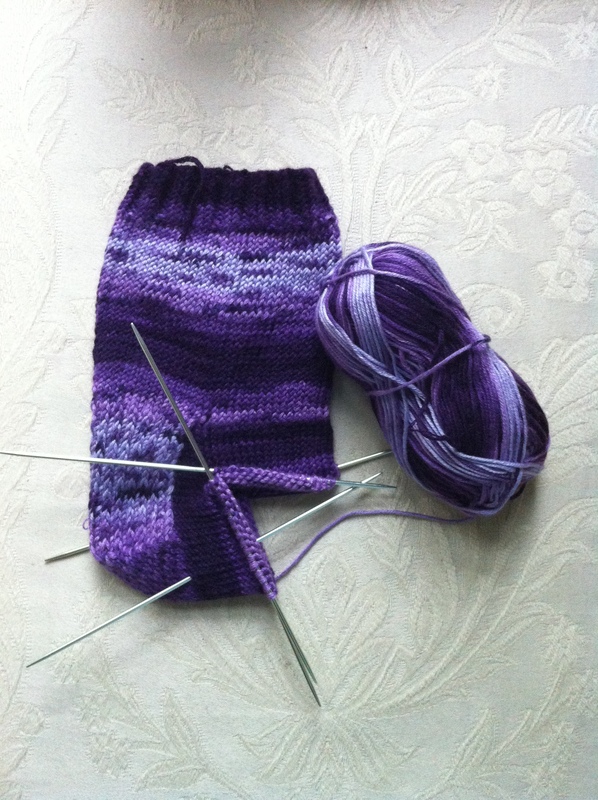 And my sock is waiting for me to start the heel. I’m excited to see how the sock turns out! Mina has returned to sleeping either on my lap or curled up next to me as I knit. 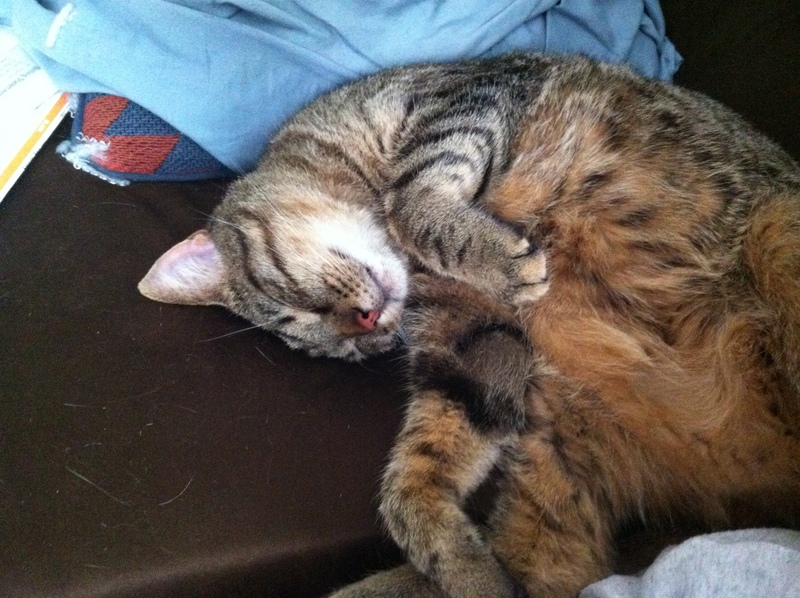 Don’t you just want to rub her fuzzy belly?